O God, enfold me in the sun, commissioned by the church of St Philip and St James, York, was composed in 1967. Setting words by Jacqueline Froom, the music bounds along pulsing with light in response to the poet’s images. 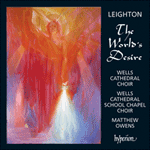 Leighton’s skill in word-setting is exemplified in the first verse when the appeal for protection from the night is heard both as a fortissimo cry from the heart, then immediately again, mezzo piano and fearfully, as if analogous to the gathering shadows, the music seeming to take on a twilight hue. In the final pages the main tune returns sung by the men, then in turn by altos and trebles leading to a sonorous culmination.